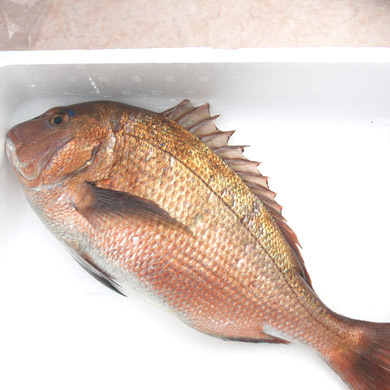 Seabreams or Snappers come in so many varieties all over thw orld that it becomes quite easy to find and adapt to various cuisines. 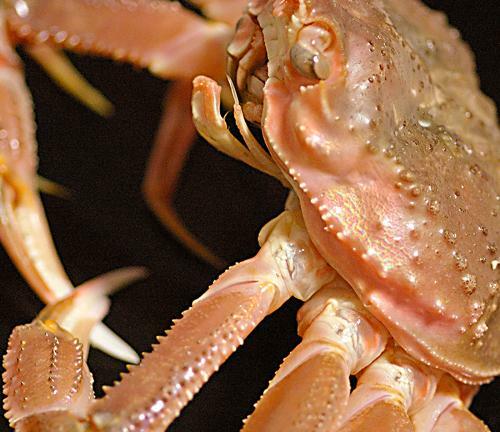 The Japanese are extremely fond of it either raw or steamed with rice. 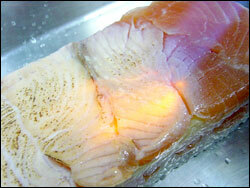 When using it as sashimi or sushi, choose a fresh fis. Look at their eyes and press with fingers. And use your nose! 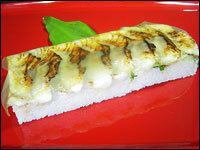 Madai/真鯛　or “True Seabream”, the most commonly used type of seabream in Japan. For an extra finishing touch for the taste, use fresh leaves of sansho/山椒 or Japanese pepper (also called ki no me/木の芽). The English name is Shichuan Pepper, although we are talking of the fresh plant here. 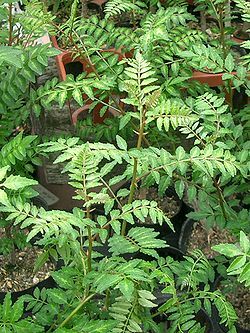 In Japan the dried and powdered leaves of Zanthoxylum sancho are used to make noodle dishes and soups mildly hot and fragrant. The whole fresh leaves, 木の芽 kinome, are used to flavour vegetables, especially bamboo shoots, and to decorate soups. Typically the young shoots are used in this way giving an aromatic lemony flavour to food. 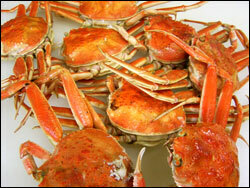 They are used to denote spring seasonality in food. The buds, seeds, flowers, and hulls are also used. Chop some leaves finely enough to use with sushi, but not to fine. Cut them as short as shown in picture. Soften light seaweed in lukewarm water and spread it over a clean cloth. 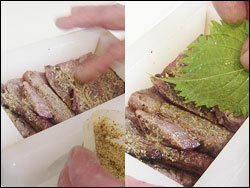 Line the bottom of the oshibako/box with slices of seabream fillet as tightly to each other as possible. Sprinkle with chopped sansho leaves. Fill with sushi rice and press. Unloose oshizushi out of the box. Brush the surface lightly with some soy sauce (I sweeten it a bit by mixing it with a little mirin/sweet sake). 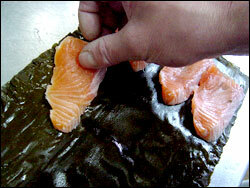 Repeat the same process twice more so as to cook only the surface and make it take a nice colour. This way you will be able to taste the fish in two different ways inside your mouth! Spread the light seaweed over the top. Cut to size and serve immediately for maximum enjoyment! 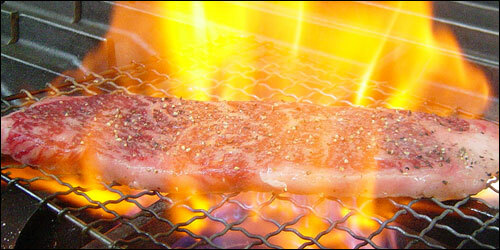 Japanese prime beef has become a registered trademark all over the world be it from Kobe or other regions. 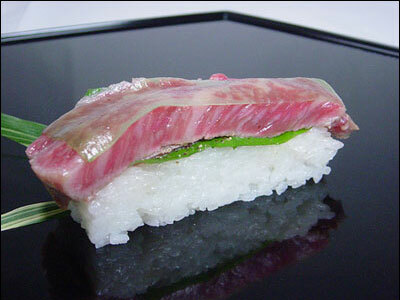 The present sushi was made with “Kuroge Gyuniku/黒毛牛肉/Black Hair Beef from animals raised to the age of 12 months in Fukui Prefecture. Do check the origin of your beef! 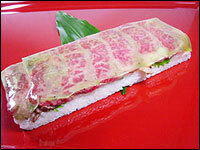 When preparing this slightly extravagant sushi, choose a large slice of prime beef with plenty of “fat veins” as shown on the above picture. Don’t choose too thick or too thin, either. Think of the proportion of the beef and rice. 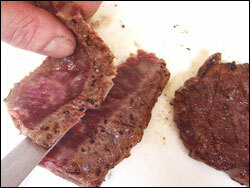 Bear in mind that the the seared beef will also loose some of its thickness. Sprinkle the beef with quality ground balck pepper and salt. Sear it or grill it lightly on both sides quickly. This process will enhance the sweetness of the meat. 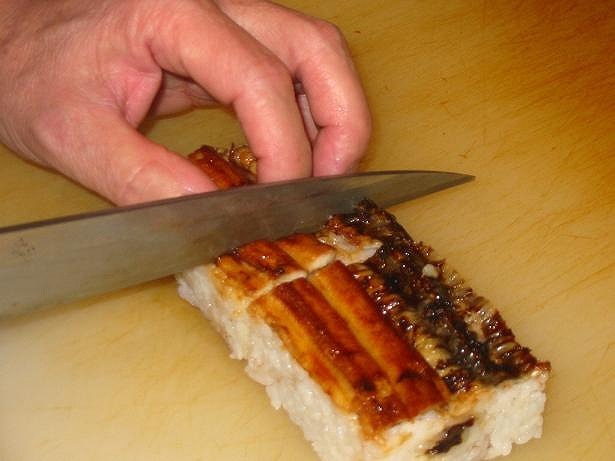 -Slice the meat into bite-sized portions as shown in above picture at a slant after having cut off the fatty extremity. 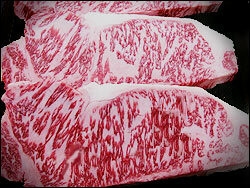 Lay the bottom of the oshibako/box with slices of beef as shown in above picture in a “staggering” fashion. If you don’t, the slices will slideaway from each other. 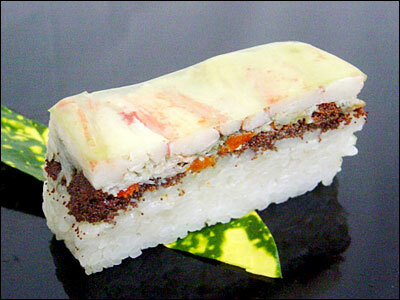 Cover with sushi rice and press. 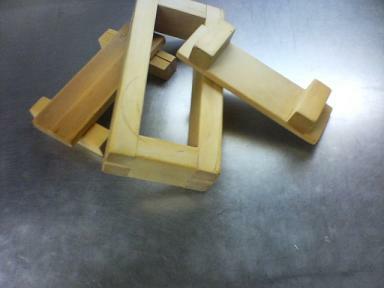 Unloose the sushi out of its box. The beef should be on top. 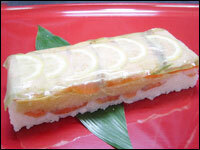 For sushi rice preparation, check HERE for previous posting! 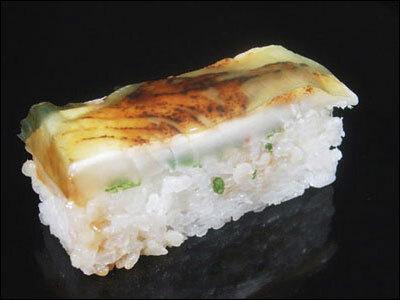 Konbushime/昆布〆means that the fish is “marinated with seaweed. 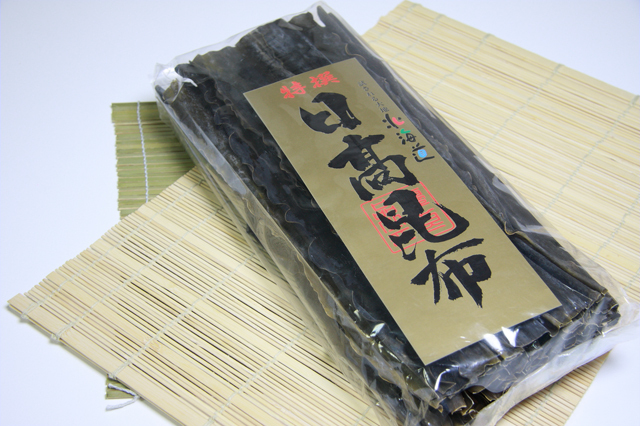 Konbu/Seaweed is now readily available on Japanese and Asian markets all over the world or on the internet. 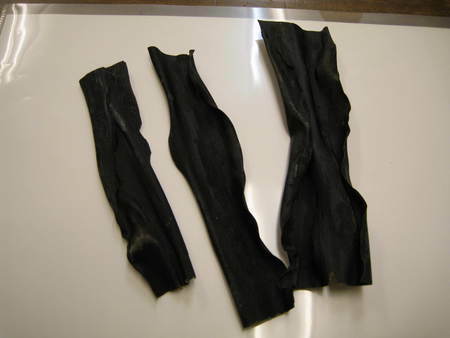 -Dark/black thick Konbu/Seaweed is bought dry and has to be softened in lukewarm water for a while. That particular step is very easy to learn. 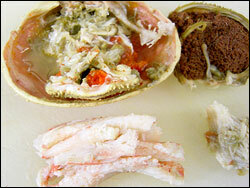 Keep in mind it is edible, although after marination, it should be discarded. 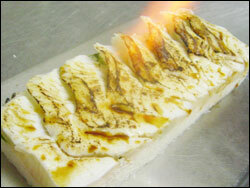 -Thin, light coloured (almost transparent) is used as an ingredient both for taste and the finishing touch. If not available, you may replace it with fine green leaves. It is called “Kagome Konbu/かごめ昆布”. 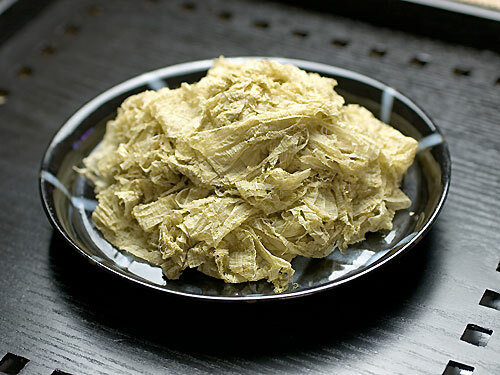 An even better light seaweed is called “Take Kawa Konbu/竹皮昆布/Bamboo Skin Saweed” and is widely used by professionals. 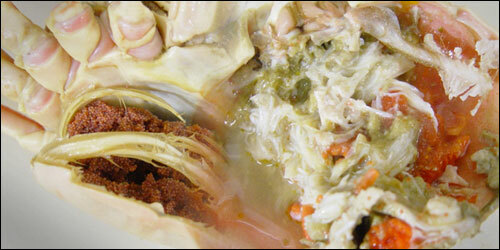 Both light coloured seaweeds have to be softened in lukewarm water, sponged off and spread into thin sheets first. But it is really worth the work! 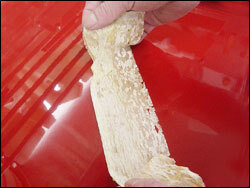 After having softened the dark konbu, spread it over a clean working table and place the fresh (fresh, please!) 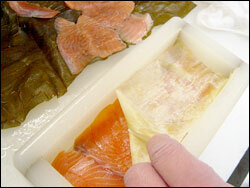 salmon slices over one sheet and covering the lot with another sheet. 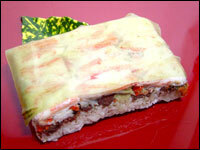 Wrap it in cellophane paper and leave it in the fridge for at least 30 minutes. 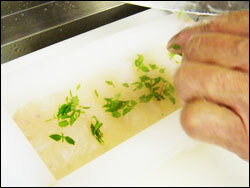 During that time soften light seaweed in lukewarm water and spread it over a clean cloth. 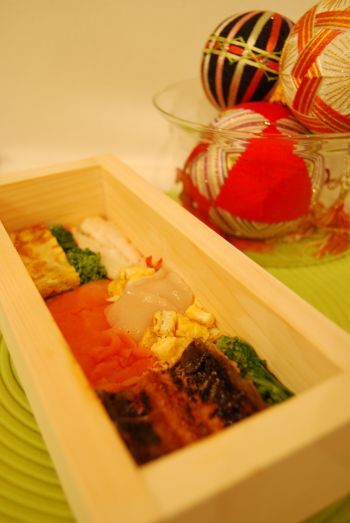 Line the bottom of the oshibako/box with one layer of salmon (no dark seaweed!). 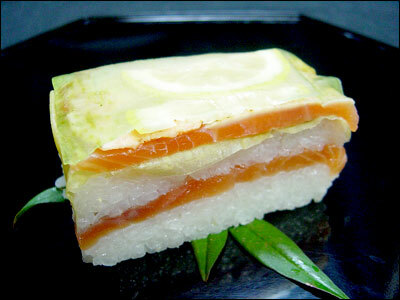 Spread light seaweed over the salmon and spread a first layer sushi rice. Repeat the same operation once more and press. The fish should be on top. 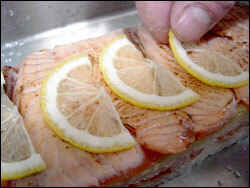 Grill the top of the fish lightly with a hand burner just enough to change the colour. That step will enable to savour two different tastes at the same time! Place very thin slices of lemon (clean organic, please!) on top of the rice. It will abate the “fishy smell/taste”. Lay another layer of fine light seaweed over the top.